Golitsyn, Vasilii [Голицын, Василий; Golicyn, Vasilij], b 1643, d 2 May 1714. Russian prince and diplomat, adviser and confidant of the Russian regent Sofiia Alekseevna (1682–9) and initiator of the Eternal Peace of 1686 with Poland. He led Russian campaigns against the Crimean Tatars in 1687 and 1689. In the unsuccessful campaign of 1687, 50,000 Cossacks took part, many of whom lost their lives after the Tatars set fire to the steppe. The blame was placed on Hetman Ivan Samoilovych, and Golitsyn with the support of a part of the Cossack starshyna had him deposed and exiled (see Kolomak Articles). 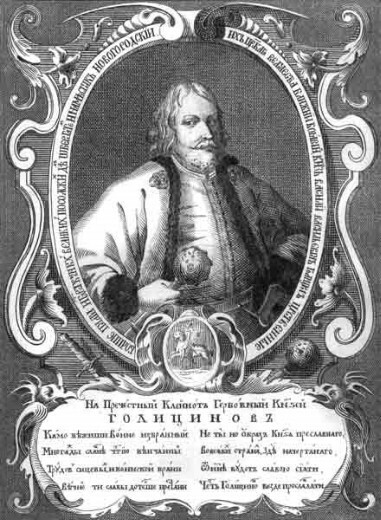 Golitsyn supported the candidacy of Ivan Mazepa as the new hetman. The campaign of 1689, led jointly by Golitsyn and Mazepa, was also not successful, and Golitsyn was removed from office when Peter I became tsar.